Why there is a need for New Schools? The growing population and the awareness of the importance of education necessitate new schools. Today’s schools offer a myriad of facilities and a parent is in a position where he can choose what suits him and what his child requires. The school’s affiliate to the different boards, like the State Board, CBSE, CICSE or the IB, based on the facilities and the requirement of the parents. The quality and standard of education will depend on the quality of the faculty, the infrastructure, and the teaching methodology adopted. Apathy and stagnation in the school sets in when the management is not aware of the new trends in pedagogy, or the top management is uncaring of the quality standards. School Consultants in India are the knowledgeable and experienced who delivers their expertise in setting up new schools, aware of the requirements of the various Boards, and experienced in leading teachers are involved, and then the vision of the new school will definitely be realized. The question that springs to mind after the decision to Open a School in India is made is whether the school should be owned or should it be a franchisee school? Should the schools be owned by an individual or a group of individuals or should the school be a franchisee of an already popular school or society? The School Consultants will perform a serious study of both the models and will make it possible to understand which would be better. Pre-primary School, Primary, Middle, Secondary or Senior Secondary? A New Primary School in India should commence from Class 1 to Class 6 or Nursery to Class 6. This gives time for the school to gear up for the Middle School Syllabus Approval Inspection by CBSE. In the same year application for Middle School Syllabus, Approval is filed with the Board. The bye-laws of the different boards clearly explain how a school can be affiliated to the respective board. The boards guide the schools in matters of the land size, number of teachers required, their educational qualifications, the room sizes, the library requirements, the Science lab requirements, among other things. A Society or a Trust or a Section 8 Company only can start a school in India. To form a Trust, minimum two members are required, but there is no limit for the maximum numbers. All the members are called the Board of Trustees who are lifetime members unless specified. Opening a new school in India, whether affiliated to CBSE, CISCE or IB Board requires a thorough study of the bye-laws. The many requirements may be confusing to a new promoter. First, a Trust/ Society/ a Section 8 Company is registered. Then a suitable piece of land, as per specifications are given in bye-laws, is bought or leased. The land use must be of Educational purpose and should be approved by a competent authority. Approved building plan following the specifications as mentioned in the bye-laws is the next step. When the first phase of the building is ready, furniture and fixtures are set in place. The recruitment of the Principal, teaching staff, admin staff, etc., is then undertaken. Starting and managing a School requires a deep study of the Bye-Laws of the Board, the study of the NBA statutes, a study of what the other schools in the neighborhood are offering, a feasibility study, the financial implications, contact and liaison with different suppliers and vendors, etc. Nevertheless, the task is not impossible and with proper guidance a successful school is possible. The most preferred education board in India is the Central Board of Secondary Education. To get the CBSE Affiliation, land of at least 2 acres is essential; the land may be procured on leased for at least 30 years. Trust or Society has to be formed, which must be a non-proprietary one. The construction of the school building should be in line with the requirements of the CBSE. The ratio of teachers and students, the qualifications of Principal and other staff according to the CBSE bye-laws must be strictly adhered to. 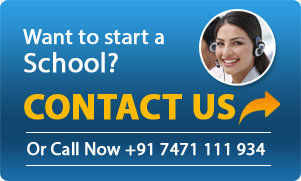 The first step in the Affiliation Process in India is to apply online to the CBSE. The Inspection Committee has then formed and on the basis of the IC, report Affiliation is granted. How to get CICSE Affiliation? How to Name Your School? When an individual or a group of individuals decide to open a new school, they would want to give an attractive name to the school. The name of the school must be in line with the mission and vision of the members of the society or Trust. The name must be catchy and should suit the thoughts and culture of the people where the school is situated. The spelling must be easy and a domain name should also be available. In India names of Gods, or the state in which the school is, and country’s names are taken as a school name. How to Select the Most Suitable Land for a School? The success of a school is determined by many factors, among which is a proper land for building a school. The land requirements for a CBSE affiliated school is at least 1.5- 2.0 acres and requires a registration or lease process in the name of the Society/Trust/Company 8. It is favorable if it is in residential areas. The land shouldn’t be on a busy highway and must be free from pollution of all kinds. Land, over which high tension wires cross, is definitely unsuitable for a school. The minimum required as per the Board may be insufficient as the school grows. So there must be scope for expansion. Thus, the most suitable land for building a school in India should be preferred for the safety of the staff and students. What are the State Bye-Laws for Opening a School? What should be ready before the School begins Functioning? Once the Society or Trust is formed, the land is bought or leased, 1st phase of building construction is complete, furniture and facilities are in place then, the selection of Principal or Head of the School, teachers and other Administrative staff are recruited. Stationery and other sundry items, library books, lab equipment, sports equipment, computers, and digital learning equipment are then purchased. This perhaps is trickier than anything else in seeking up to a school- the Principal and Teachers! The Education Board of India selects the Principal on the basis of qualifications and experience. The minimum qualifications required are Masters in a school-teaching subject with a degree in Education. Experience of at least 5 years is a must in some administrative capacity. Teaching has ceased to be teacher-centric, it is now learner-centric. The curriculum does not prepare the teacher for what is required on the job front. Exposure to the electronic media has made children smarter. To cope up with the innovations in pedagogy, continuous training is a must for teachers. Training Sessions in India strengthens the confidence, motivates and deepens the knowledge of the teachers. School Consultants conduct regular training programs in India to prepare the teachers and customize their teaching to suit different ability groups. Home or school, stationery is required everywhere, only the size and quantity varies. Apart from the usual office stationery, classroom stationery like chalk and duster, there are many more things required. To name a few Admission and Withdrawal register, Students personal files, Staff personal file, Staff attendance registers, Students’ attendance registers, teaching plan registers, Marks registers, transport log registers, drivers’ logbooks, visitors’ registers, and others. Customized stationery brings uniformity and a style in presentation. Why does a School need a Logo? How to select a Logo? Having a visual identity means having an effective tool for communicating the vision, values, and culture of a community. A logo is a symbol of what the school stands for. The Governing body of CBSE at its meeting held on 29th June 2010 resolved to make it mandatory for every affiliated school to develop their own website containing comprehensive information about the school and its management. The information to be provided on the website of the school includes affiliation status, details of infrastructure, names, and designation of teachers, class-wise, section wise, the strength of the students, address-postal, and email, telephone numbers, details of School Managing Committee to be updated before 15th September every year. What is the School Managing Committee? How is it formed? CBSE Affiliated Schools must form a school managing committee (SMC). The members of the Committee take the active interest in the school and are empowered to make decisions for the smooth functioning of the school. The school managing committee should have a maximum of 21 members. Members of the Society/ Trust, the Head of the school are permanent members while the others serve for 3 years. School buildings must follow the norms of the NBC and the requirements of the Education Boards. In general, the number of classrooms required initially will depend on how many classes and sections are going to commence in the first year. Apart from the classrooms, rooms for administrative purposes, the Principal’s room, a staff room, activity rooms, a composite Science Lab, a Library are the other rooms required. The classroom size must be 40 square meters. and Library must be of 112 square meters. The rooms must be well lit and well ventilated. Basic facilities must be provided. Modern school buildings make special provisions for the physically handicapped students and staff. Either a ramp or an elevator is provided. Budgeting is an essential exercise which every management does, whether a new school or an existing school. No bank will give the finance for more than 60 to 70% (approx.) of the project cost. The loan application is expected to be supported with necessary details of the proposed land, approvals and permissions for setting up of a school. For finance, the financial institution would be seeking a collateral security of the same or more amount against the loan being offered. A project report needs to be submitted with the 10-year roadmap, which includes the expected revenue and expenses along with the details of fulfilling the gaps in operating expenses in the initial few years. This project report would also include the details of capital and operation expenses for the first 10 years. For the success of any project, an expert advice is always important and helpful, in terms of planning and executing the same in the best possible way with minimum expenses and maximum output. Hiring an experienced consultant makes it a very cost-effective option as the valuable advice and help in execution will surely be financially advantageous to the promoter. It is in this and many myriad ways that a School Consultant in India helps in making a school successful.